The traditional-style Lake House End Table has a warm finish accented by antique brass pulls, making it the perfect complement to today's upholstery styles. Constructed of hardwood solids with oak veneers and oak finish, this end table features appealing planked tops and tapered legs. One drawer offers storage for remote controls, a deck of cards, and other small items, and the veneered lower shelf provides further display and storage space. 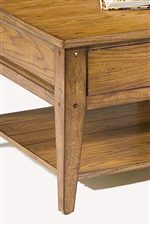 The Lake House 1-Drawer End Table by Liberty Furniture at Standard Furniture in the Birmingham, Huntsville, Hoover, Decatur, Alabaster, Bessemer, AL area. Product availability may vary. Contact us for the most current availability on this product. Wood & Finish Multi-Step Hand Applied Finish. Drawer / Shelf Construction Veneered Shelves.Push Through Drawers. 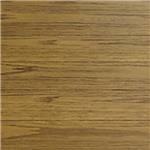 Description: Top Appealing Planked Tops. Case Construction Select hardwoods and oak veneers. This Lake House occasional table collection features appealing planked tops and tapered legs. Constructed of hardwood solids with oak veneers. Each piece will complement today's upholstery with its veneered shelves, multi-step hand applied finish, antique brass hardware and warm oak finish. The Lake House collection is a great option if you are looking for Casual furniture in the Birmingham, Huntsville, Hoover, Decatur, Alabaster, Bessemer, AL area. Tapered Legs & Veneered Shelf. Browse other items in the Lake House collection from Standard Furniture in the Birmingham, Huntsville, Hoover, Decatur, Alabaster, Bessemer, AL area.